Choosing from the menu Special > Abbreviations allows you to enter directions quickly and accurately when dispensing medicines. It is worth mentioning that abbreviations may also be used in other situations - e.g. if a significant number of customers live in the same locality, an abbreviated form of their address could be employed. Such abbreviations are created in the same way as described below. Double-click an abbreviation to edit it. Click the New button to add a new abbreviation. Type an abbreviation and the text that it will expand to. 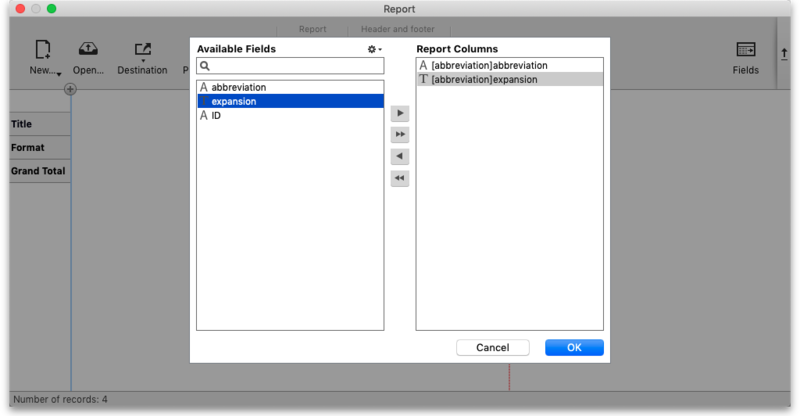 Click the Report button to construct a simple report listing all abbreviations. This report can be previewed or printed. When you are issuing an item you can mix abbreviations and your own text to add common directions quickly. Do not use actual words as your abbreviation, or else attempting to type the word will result in the expanded text appearing on your label! If you change an abbreviation or add a new one, you will see the change immediately (v317 or later), but in a multi-user environment other users will have to log out and log in (use Switch user to do this quickly) to see the edited or added abbreviations. The procedure for importing a file containing your abbreviations will be found here. From the abbreviations window, click the Report button.